PORTrayal is an exhibition of new atworks depicting or responding to Port Adelaide’s past, present and future. 16 South Australian artists are contributing works, including Force of Nature artists, Dan and Emma Monceaux. The exhibition will feature 2D and 3D artworks inspired by the Port’s history, people, flora and fauna, ships, sheds, and architecture. Some pieces also make cultural, social, or environmental statements. Dan & Emma Monceaux have each made new works for the exhibition. Dan Monceaux’s new video piece entitled “The raw prawn” will be showing on a TV screen and a satirical poster of his fictitious comic book “Judge Dredge: Spoiled Rotten” will be hanging on the wall. Emma Monceaux’s recently developed skills in kiln-formed glass and acrylic painting will be on show, in the form of two series of abstract pieces inspired by the colours and movement of the Port River. Dan and Emma have both chosen to make artworks in response to Flinders Ports’ recent proposal to dredge the Port River to accommodate larger vessels. The exhibition will be officially opened by the Hon. Tammy Franks MLC (Australian Greens). Live music will also be performed by Rafa Godoy. 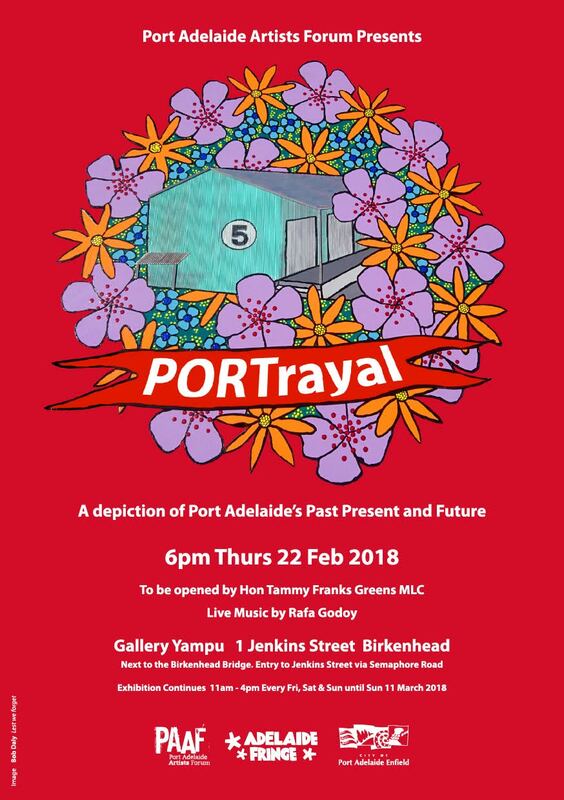 Gallery Yampu & Port Adelaide Artists Forum Inc.
Gallery Yampu sits on the edge of the Port’s inner harbour at the north-western end of the Birkenhead Bridge. The gallery looks out across the water and gallery visitors can sometimes be rewarded with a visit from a pelican or a glimpse of a bottlenose dolphin. “Yampu” is the Kaurna word for dolphin. Port Adelaide Artists Forum (PAAF) has managed and presented community arts projects, exhibitions, performances and events for over 12 years. PAAF is based at Gallery Yampu on the edge of the Ports inner harbor and is run by a team of dedicated volunteers. Gallery Yampu is also available for hire. Find out more on Facebook at: PortAdelaide ArtistsForum and Gallery Yampu. Name: Port Adelaide Artists Forum Inc.